What I would like to do is add another HP raid card with 2x SAS connectors to create a 8 drive raid 10. Is this possible or how is the backplane set up? 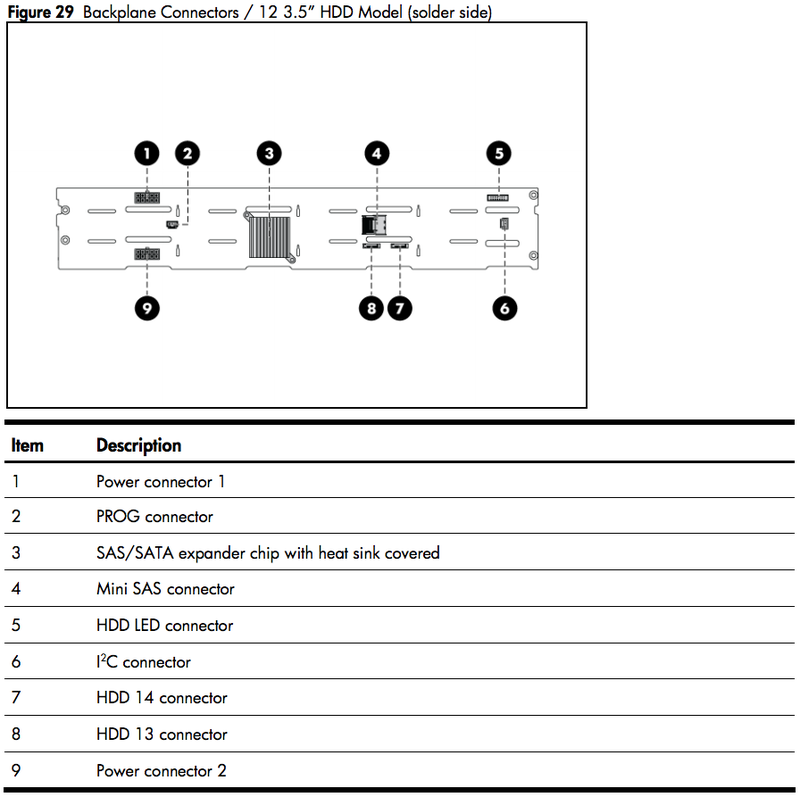 The HP ProLiant DL180 G6 12-bay LFF drive backplane has a single 4-lane SFF-8087 SAS connector (See #4 on the graphic below). The backplane has an integrated SAS expander that accommodates the 12 bays. The expander actually supports 14-ports, with two backplane-mounted SATA connectors to interface to the rear-mount 2-drive cage option (HP #488234-B21). If you're interested in replacing your Smart Array P212 controller, you can safely use a Smart Array P410 or Smart Array P812 controller to accomplish your goal. Only one SFF-8087 port will be used. Also see the DL180 G6 Service Guide. Not the answer you're looking for? Browse other questions tagged storage hp hp-proliant hp-smart-array or ask your own question. Can we “add” more SAS ports to an existing backplane? HP DL180 G6 P410 8x SATA 1TB, what is the optimal configuration? Rack Storage - Backplane with 20 SATA connectors or backplane with 5 Mini SAS connectors? SAS Expander backplane performance drops when more than 8 drives are active?